From the Editor: Last October I had agreed to do a phone interview of author Steven Zaloga for a piece that was going to run in Battlefield.scout.com. Unfortunately, Battlefield did not achieve their target readership numbers and the editor was forced to put it into hiatus before the Zaloga interview was posted. Rather than see it get lost, I received permission from the editor of Battlefield to publish the interview on my blog. I have since moved the interview from the blog to Tank and AFV News.com. I want to thank Battlefield for helping set up this interview and for Mr. Zaloga for giving his time. I highly recommend any book by Mr. Zaloga. Be sure to check out his upcoming book “Armored Champion” when it comes out this spring. Steven Zaloga is an author and defense analyst known worldwide for his articles and publications on military technology. He has written over a hundred books on military technology and military history, including “Armored Thunderbolt: The US Army Sherman in World War II”, one of the most highly regarded histories of the Sherman Tank. His books have been translated into Japanese, German, Polish, Czech, Romanian, and Russian. He was a special correspondent for Jane’s Intelligence Review and is on the executive board of the Journal of Slavic Military Studies and the New York Military Affairs Symposium. From 1987 through 1992, he was the writer/producer for Video Ordnance Inc., preparing their TV series Firepower. He holds a BA in history from Union College and an MA in history from Columbia University. What did you think about the film “Fury” in terms of historical accuracy? Did it capture the look and feel of World War II tank combat? I thought it was a very good film within the limits of what you can do in Hollywood. Some people get all spun up in claiming this bit is inaccurate or whatever, nitpicking some of the small details. My outlook is more from the broad picture, looking at it from the standpoint of a general audience, not a bunch of tank specialists. I thought it was very well done, I thought it was very authentic. It had the usual Hollywood issues, some things had to be compressed. For example a lot of the engagements occurred at shorter ranges so that they could get everything within an image. I’ve actually done TV writing, I know the problems of trying to compress dates and compress imagery so that it fits on the screen. There was also the need to kind of jazz up some of the encounters. So for example the last scene where the tank is isolated and fighting against the German unit, from a purely historical standpoint I would have some questions about it. But from a dramatic standpoint, from the standpoint of a movie maker I understand why they depicted it the way they did. But overall my impression was really favorable, I thought they really made a serious effort to get the feel of the time. I was very impressed with the depiction of the US units moving into the German town. I mean that stuff looks straight out of the pages of black and white photos of the fighting of April 1945. They really went out of their way to create that feel. Overall I was really impressed with the film. Like I say, you can nitpick a lot of little stuff, but who cares. One thing I was wondering about while watching the film was the idea of a typist being assigned to a tank. I know that sort of thing happened in the Normandy campaign (Summer 1944). Was that common by the period of the film, April 1945? It was actually a more common occurrence later in the war especially after the Bulge, the Ardennes fighting. In Normandy there were heavy losses but the US Army units usually were over strength, they usually had about 20 percent over strength. They could actually replace the crews more readily with trained tank crews. By the late summer after all the casualties they had suffered it started to become a problem so in unit records you start seeing complaints about the quality of the personnel that are being sent forward to act as tank crew. By the time of the Ardennes (December 1944) it becomes a more serious problem, they were starting to replace tank crews with essentially untrained crew. The way they depicted it in the film was actually quite accurate. The two positions that most commonly got filled by untrained replacements would be the loader and the bow gunner. The character Norman was the bow gunner, that was one of the positions that would be filled by a replacement and the other replacement would generally be the loader because they didn’t require the type of technical skill that the driver , the gunner or the commander required. Those three other positions tended to be filled by someone with experience, even if they had to go outside the crew for one of those slots. One of the highlights of the film for many is the use of a real Tiger tank in the filming. At that stage in the war, how many Tiger tanks would have actually been in the field? To give you a general sense, in April of 1945 the Germans have about 90 tanks on all of the Western Front. All tanks, everything, Panthers, Panzer IV, Tigers. They had a handful of Tigers. They had about 400 other armored vehicles, assault guns, Stug III and things like that. So they had just short of 500 armored vehicles on the entire Western Front, from the North Sea all the way down to Bavaria and Southern Germany. At that point in time the United States had 11,000 tank and tank destroyers, to give you some sense of the disparity in forces. How many times did US forces encounter Tiger tanks? When you read unit accounts, whether it’s the actual unit after action reports or the published books, everyone talks about Tiger tanks. But in looking at it in both German records and US records, I’ve only found three instances in all the fighting from Normandy to 1945 where the US encountered Tigers. And by Tigers I mean Tiger 1, the type of tank we saw in the film. I’m not talking King Tigers, the strange thing is that the US Army encountered King Tigers far more often than Tigers. That’s partly because there weren’t a lot of Tigers left by 1944, production ends in August 1944. There were not a lot of Tigers in Normandy, they were mostly in the British sector, the British saw a lot of Tigers. Part of the issue is that US tankers were notorious for identifying everything as a Tiger tank, everything from Stug III assault guns to Panzer IV and Panthers and Tigers. There was one incident in August of 1944 where 3rd Armored division ran into three Tigers that were damaged and being pulled back on a train, they shot them up with an anti-aircraft half-track. And then there was a single Tiger company up in the Bulge that was involved in some fighting. And then there was one short set of instances in April 1945, right around the period of the film, where there was a small isolated Tiger unit that actually got engaged with one of the new US M26 Pershing tank units. They knocked out a Pershing and then in turn that Tiger was knocked out and the Pershing tanks knocked out another King Tiger over the following days. So I found three verifiable instances of Tigers encountering, or having skirmishes with US troops in 1944-45. So it was very uncommon. It definitely could have happened, there are certainly lots of gaps in the historical record both on the German side and the US side. I think the idea that the US encountered a lot of Tigers during WW2 is simply due to the tendency of the US troops to call all German tanks Tigers. It’s the same thing on the artillery side. Every time US troops are fired upon, it’s an 88, whether it’s a 75mm Pak 40 anti-tank gun, a real 88, a 105mm field howitzer, they were all called 88’s. At the beginning of the film there is the statement about US tanks being under-gunned and under armored compared to their German adversaries. How successful was the Sherman tank as a weapons system? I actually just finished a book that will be out in May next year called “Armored Champion” which is a general look at tank warfare in World War 2 that puts it into a broader context. One of the things I did in the new book Armored Champion is try to distinguish between what I call “tankers choice” and “commanders choice.” And what I mean by that is the tankers choice is what the tanker wants, the individual tank crew wants. The individual tank crew obviously wants a tank that is extremely powerful, very well armored, had a very powerful gun. So if you compare a Tiger or a Panther or a Sherman, the tanker is going to want the most powerful tank available. The commanders choice is very different, because the commander wants combat power. And combat power doesn’t necessarily come from the best technology because in many cases the best technology has issues. So the Tiger during World War 2 cost the Germans something in the neighborhood of 300,000 Reich marks. You can buy a Stug III assault gun for about 70,000 Reich marks or a Panzer IV tank for about 100,000 Reich marks. So in other words you can get three Panzer IV tanks for every Tiger that you buy. And on top of it, the Tiger, because it was so big it was extremely unreliable. Things like the Stug III and Panzer IV had about double the reliability of Tiger. So if you’re a German senior commander, it’s an open question whether you want a force built up entirely of Tigers because they are unreliable and expensive so you are not going to get a lot of them. You’re going to get a lot more Panzer IV or Stug III vehicles for your Reich marks. So in that book I’m trying to compare those type of issues. And you know, that comes up with the Sherman. One reason there is 11,000 US tanks and tank destroyers In Germany in April 1945 is because the US decided to concentrate on a tank that was extremely reliable and relatively economical to build. And I don’t think anyone would claim that the Sherman was the best tank from the perspective of the tank crew, it didn’t have the best armor, it didn’t have the best gun, but from commanders perspective it was an excellent weapon. There were just lots and lots of them, so they gave the commander a lot of battlefield power. That can’t be said for a lot of the better German tanks because they simply were too expensive to be built in large numbers and they weren’t reliable enough, you couldn’t count on them. So it depends on the perspective that you are looking at it from. Did US tankers suffer disproportionately in terms of casualties compared to their opponents or to other branches of service? There is a popular saying that it took five Sherman tanks to kill a Tiger that gets mentioned often in books and documentaries. No, that whole business about five Shermans for every one German tank, I don’t really know where that comes from, that seems to be totally apocryphal. My suspicion of where it comes from is not the US use of the Sherman but probably from the British use of the Sherman. And I think that that issue has been misunderstood. The Brits took very heavy losses with their Sherman tanks in the Normandy fighting against German units, in the Caen sector in Summer of 1944. In a lot of early tank writing, we’re talking 1960’s and 1970’s, practically everything that was written about tanks, and written about US tanks were written by British authors. There weren’t a lot of US tank books out at the time. So a lot of the stuff that came out about the Sherman came out from the British side. And the British side did take disproportionate casualties in Normandy. And it’s largely for tactical reasons. I’m not going to get into it, it’s way too complicated to explain, but yes the British did suffer very high losses against the Germans for a variety of reasons. That was not the case on the US side. What people don’t realize is that the US tank force didn’t really encounter very many German tanks in Normandy. The first month of the fighting was concentrated mostly up the Cotentin Peninsula during the drive by 7th Corps to Cherbourg. The Germans in Cotentin Peninsula had two tank battalions, both equipped with war booty French tanks, so basically very poor quality tanks. There wasn’t a lot of tank fighting. Then in the month of July the US pushing through the boscages country, finally resulting in operation Cobra, the big breakout operation by 2nd and 3rd armored divisions at the end of the month. The Bocage country wasn’t very good tank country either. The Germans did have a couple of tank divisions there, the Panzer Lehr Division, the 2nd SS Panzer Division Das Reich. 2nd SS Panzer Das Reich didn’t see a lot of tank fighting simply because the terrain wasn’t suitable. Panzer Lehr did launch one major attack in the middle of July and got completely shot up by the US side. But in the case of both German Panzer divisions they didn’t see much fighting against US tank forces, they were fighting mostly against US infantry and tank destroyers and they took significant losses. And then in August of course the breakout operations, so US tanks are running like wild through Brittany, through France to Paris and there are scattered encounters with German tanks but on a very small scale. The first time the US has a really big tank on tank encounter with German armor is Arracourt, the fighting in Lorraine in September of 1944. Fourth Armored Division is confronted by a few of the new German Panzer Brigades. And that’s a lopsided victory on the US side. Patton’s Third Army trounces the Panzer Brigades in Lorraine, largely because the US unit involved there, the Fourth Armored Division, by that stage was a well experienced, well trained unit and the new Panzer Brigade, even though they had lots of brand new shiny Panther tanks, were new units with varying experience and they performed very badly. And that remains one of the most intense series of tank battle the US Army fought in World War II where there were really significant numbers of tanks facing tanks in a relatively small area. So after Normandy there is not much tank on tank fighting until the Battle of the Bulge in late December of 44? There is hardly anything left of the German tank forces in the West after Normandy and after the September battles. There are small encounters like up in the Aachen corridor in September of 1944. But then there is not another spurt of tank fighting until the Bulge, and then of course in the Ardennes there is a lot of tank fighting, but again, on a very scattered scale. And then after the Ardennes there is not a lot. The German army in the west doesn’t get many new tanks after the Ardennes so there is mostly small scale encounters, but by then the US tank force outnumbers the German tank force 10 to 1 or more, and not even counting the British force. After the Ardennes the Germans just don’t have many tanks out in the West, they ship most of their new tanks East to deal with the Red Army. To continue on the topic of common perceptions regarding Sherman tanks, there are two intertwined myths that get mentioned often. The first is that the Sherman was highly susceptible to burning, leading to the nickname “Ronson” and the second is that German tanks didn’t burn because they had diesel engines. The whole Ronson thing is nonsense because as you well know the Germans tanks were gasoline powered also. And the whole thing about the gasoline engines being the source of the problem is a canard. If you take a look at any assessment, whether its German or American, the problem of tank fires in World War II is ammunition. The primary source of tank fires in World War II is ammunition and the reason is because you can’t stop them. A tank engine fire with gasoline can be stopped, most World War II tanks had fire extinguishers so if you had a fire in the engine compartment the fire extinguishers could put the fire out as long as it wasn’t too catastrophic. But an ammunition fire, once it starts you can’t stop it. The ammunition propellant in tanks is an oxidizer so once the ammunition starts burning that’s the end. And especially in the earlier Shermans which had the ammunition in the sponsons. That became a big problem because it was all in a compressed area. By the later Summer of 1944 once the newer wet stowage Shermans come in, that problem starts to disappear because the new ammunition stowage gets away from that. But the problem with the comparison, the so-called Ronson issue is because people don’t look at the German side. The Germans had the same kind of problems with the Panzer IV and the Panther. In fact the Panther had a bad reputation for being a fire trap partly from fuel line leaks and partly because of the nature of the transmission. However, people haven’t bothered to look at the German records and it’s probably because the German records just aren’t as available. People have access to English language records and English language memoirs but they don’t have access to German language memoirs. And quite honestly there aren’t that many German language memoirs available even in German. There are dozens if not hundreds of American and British accounts of crews that served on Shermans with all the usual complaints and stuff but there are hardly any accounts from the German side of Panzer IV crews and Panther crews who served in the West. There are some from the Eastern front, there are hardly any from the West. If that stuff had been available you would have seen the same kind of complaints. We can see from photographic evidence that the Germans had the same kinds of catastrophic ammunition fires that the US suffered. The Panzer IV was no better protected than the Sherman as far as ammunition fires were concerned. So I think that’s largely a matter of perspective, we have a lot of US and British accounts complaining about tank fires, but we just don’t have the comparable accounts from the German side. There is also a disproportionate of attention focusing in on the Tiger. So there’s lots and lots and lots of accounts of Tiger crews but the Tigers weren’t very common, even on the Eastern Front. And there is certainly not the same level of detail when it comes to Panzer IV and Panther, which were the more common German tank types. As a writer, have you been able to interview former Sherman tank crew or get their perspectives? One of my best World War 2 contacts was a company commander in 37th Tank Battalion in the 4th Armored Division, a guy by the name of Jimmie Leach. Jim was a company commander during World War II on Shermans, saw a lot of combat and then directed the Armor School for a number of years afterward. And then after he retired from the army he acted as chief sales guy for Teledyne Continental down in Washington DC area. I used to run into him every year. Jimmie was not a well known figure amongst your average tank enthusiast audience because he didn’t write a lot of stuff. It’s a shame because he really knew a lot of stuff and he knew all the right people, he knew Creighton Abrams. He was an absolutely wonderful person to talk to because he was a company commander in World War II, he stayed in the armor branch after the war, he stayed involved during the cold war years, he kept on top of all these things. After he retired from the army he stayed in industry so he really knew this stuff. He was very influential in my early writing because whenever I’d do anything on the Sherman, I’d run a copy past him and say “Ok Jimmie, let’s talk reality, what do you think about this?” And he would come back with lot and lots of very helpful comments. So he was really instrumental on my early writing on the Sherman tank. I was always very appreciative of his efforts. Any other tankers you were able to talk to about their experiences? I got lucky with a number of other tankers. I did some stuff on the fighting in Tunisia, I corresponded with some tankers that served in Tunisia. A good friend of my dad was a Sherman gunner in Fourth Armored Division and I talked to him quite a bit about tank fighting in France and in Europe. In fact this friend of my dad told me of one occasion that his most frightening encounter when he was a Sherman gunner. This was a night battle in France where several of the tanks got caught in a small village, not unlike what happened in Fury. They got attacked by German infantry and they had no infantry of their own around them to defend themselves against German infantry. He said the most frightening thing was that the German infantry started clamoring all over the Shermans trying to punch open the hatches using bayonets. One of the things in Fury, one minor little detail the film got wrong is that Shermans have locks. You can prevent people being inside the tank using the latch lock. The German infantry, they didn’t have Panzerfaust, they were literally trying to pry open the hatches using bayonets. And then somebody in the tank platoon radioed to everyone and said “start shooting at each other with .30 cal.” So they started using the bow machine gun and the coax .30 cal shooting at each other’s tanks and they basically stripped off all the enemy infantry. He said he remembered it quite clearly because they used to stow all their personal gear on the outside of the tanks, but after that encounter they didn’t have any more personal gear because it was all shot to bits. There rucksacks and their tarp for the tank and all their other stuff got all shot up. This included the one other thing they had which was absolutely essential tank equipment if you were in Patton’s Third Army; a broom. One of the stories that doesn’t get out too much is that any tank unit in Patton’s Third Army had to have a broom. The reason was that you had to keep your tank swept down and clean. Because Patton would show up, and Patton had a bad habit of showing up at the 4th Armored Division because it was his favorite Division. He had people fined if the tank was too dirty. For people that have seen Fury and would like to go see some of these historic armored vehicles, has the US done a very good job of preserving our armored history? No, not at all, I mean, it’s a national scandal how bad it is. Until recently, until five or six years ago there were two significant collections. There was the Patton collection down at Fort Knox down at the armor school and there was the Ordnance Museum over at Aberdeen Proving Ground (Maryland.) With BRAC (Base Realignment and Closure), the base realignment program, they basically took both collections and just threw them away. There were plans to move the Aberdeen collection down to Fort Lee. It was in fact moved down there but the Army has no money, so the tanks are basically sitting out in an open field rusting away. The same thing happened with the Patton museum collection, that was sent over to Fort Benning and its basically sitting in the motor pool, with nothing to show and just rusting away. The situation before BRAC was not very good, it’s embarrassing how bad the situation was at Aberdeen, although the last curator over there really started to make some efforts to restore some vehicles. The Patton Museum always had a small volunteer staff that did a very good job at restoring vehicles, so when the tanks were still at the Patton Museum they still had some runners and the small staff there did a very good job trying to keep things going on a real shoestring budget. But after BRAC hit, it’s just a national scandal. They have thrown away our history, everything is just sitting and rusting. There is a little bit of relief on the private side, there are a few private collections. There was a wonderful collection in Portola Valley out in California that was privately owned by Jacque Littlefield. But after he died the collection was broken up, part of it is going to a new museum by the Collins Foundation in Massachusetts. There is another private collection by Alan Cors in the Manassas Virgina area. They stage an annual event down near Manassas or Quantico every year. So the only opportunity right now for the American public to see tanks is the private collections. The two large national collections are basically off limits to everybody right at the moment and lord only knows when they will ever reappear to the public. The Army doesn’t have the money and they really don’t have the interest in preserving armor history. In contrast are the foreign collections. Practically every other major foreign country has a wonderful tank collection. Britain has the superb Tank Museum collection at Bovington that’s existed since World War II. The British take a lot of pride in their tank history because they were instrumental in early tank history, so Bovington is a wonderful collection. They have running examples. They have a very extensive collection of not only British armor but world armor. The French have a superb collection at the Cavalry school at Samur. They do an annual outside exhibit called the carrousel. They have a wonderful collection there, very well preserved. The Germans have a couple of collections, one private collection at Sinsheim and a national collection and Munster. The Russians have a large collection at Kubinka and several small collections. The Poles have two collections, both in the Warsaw area. The Czechs have two good collections. So for people going to Europe, there are lots of opportunities to see tanks, the bad thing is that in the United States there is not much to see. Have you noticed an increase in interest about tanks from the general public? I think that in general tanks have attracted a lot more attention back when I first started. When I was starting to get interested in tank history in the 1960’s, there really wasn’t anything. There always has been a lot of really good histories on military aircraft, which is the area I first started in. Tank books back in the 1960’s and well into the 1970’s were very thin on the ground. Over the past decade or two there has been a real increase in the quality of research on tanks all over the world, not only the United States. In France there has been a massive increase in the amount of material available on French tanks, the same is true in Russia. The Russians right now publish a lot of stuff on Russian tank history. There is still not a lot out of Germany, there is a lot of stuff on German tanks but it tends to be done in the United States. There is still something of a gap on the Germans doing tank history, and that’s for kind of unique reasons. But everywhere else there has been a big upsurge in interest in tank history. Outside of books on tanks, you have also written some campaign histories as well. Any plans for more of these sorts of books in the future? Personally I like writing campaign histories most of all. Osprey publishing has a series called “Campaign” so I have been doing books fairly regularly with them. I actually started off doing Eastern Front books with them, I did Operation Bagration which is the Summer 1944 Red Army offensive that crushed German Army Group Center. I then started to switch over to US Army campaigns in the European Theatre, I started out with some D-Day books and then worked my through the ETO campaigns. I just had a book come out on the US side of Operation Market Garden. Early next year I have a book coming out on the Cherbourg campaign, the US fighting in Normandy in June of 1944. At the moment I am working on a book for a new Osprey Publishing series called “Combat” which is a companion series to the existing “Duel” series, but instead of being tank vs tank it is infantry vs infantry. I’m taking a look at US infantry versus German infantry in the European theatre in the Summer and Winter of 1944. And I have the usual assortment of tank books that are either on the verge of being published or are on the list to be published. My next big tank book is the one I mentioned earlier called “Armored Champion” which is a more general overview asking “what was the best tank of WW2.”It goes through the war in chapters and chronological chunks and takes a look at what the best tanks were for a given period for a given campaign. You have also published quite a few photo collection books. Over the years I’ve collected tens of thousands of historical photos for the various campaign books and the various tank histories. It’s partly related to my book writing but it’s also partly related to my modeling. Modeling is a very visual field, so you need a lot of photos and the publishers I’ve worked for such as Osprey are very visually oriented. They are not like the old fashioned University oriented publishers who tend not to have a lot of pictures. Osprey is much more contemporary as far as their view of book publishing so they tend to be heavily illustrated and for illustrations you need a lot of photos. Not only the photos that are published in the books, but I don’t think people realize how much work there is behind the scenes providing photos to the illustrators to do the color illustrations and the maps for those books, that requires a tremendous amount of illustrated material. I probably actually spend doing the references for the illustrations that are in the Osprey books as the actual text. And I don’t think people appreciate the amount of effort that goes into that. One of the more popular books regarding the Sherman tank is “Death Traps” by Belton Cooper. This memoir by a World War II 3rd Armor Division Ordnance officer seems to have generated a fair amount of controversy amongst tank enthusiasts. What are your thoughts on it? I don’t want to call it a terrible book but it’s a terrible source if it’s the only thing people read. It’s ok as a book if you read that and a lot of the other stuff but the problem is that a lot of people read that and think that it’s the be all and end all to explain US tanks in WW2. To begin with it is ghost written, it’s not only Belton Cooper, it’s the ghost writer talking as well. It’s very hard to distinguish Belton Coopers stuff from the ghost writers. I’ve talked to Belton Cooper a number of times, and the problem is that by the time that Belton Cooper got to write the book, he was quite a bit older, his memories were just not all that good so a lot of the stuff that is in the book didn’t even come out of his mouth. So it’s not a very reliable account of US tanks in WW2 even though it’s very popular, probably the single most widely read book on US tanks in WW2 It’s really a shame that that’s the case. I don’t mean Belton Cooper anything ill but the problem is that it’s not a very representative account of tank fighting in WW2. It’s from the perspective of an ordnance officer not a tank officer and it somewhat distorts people’s perception of what tank fighting was like in WW2. Belton Cooper didn’t go back and do any research after the war and you got to keep in mind who he was in the war, he was a young Ordnance Lieutenant. In the book he talks as though he understood what George Patton was thinking or what the US Army was thinking. He didn’t have that perspective. You know a young lieutenant does not have the big picture of what the US Army is trying to do. He could see it from the very grim reality of repairing knocked out and damaged tanks, but he was not a tank officer, he was an ordnance officer, he was involved in tank maintenance. And so when you talk to the tank crews it’s a very different perspective. And over the years I’ve talked to a lot of tank crews, I’ve gone through tons and tons, thousands of pages of tank battalion after action reports and armored division after action reports and the perspective that you get looking at the big picture is very different from the perspective from one set of eyes from a young army lieutenant. Cooper’s memoirs are very interesting, I found them really fascinating when they first came out, and I have talked to Belton Cooper on a number of occasions, but it’s a very limited perspective on US tank operations. German armor seems to get the lion’s share of attention when it comes to books published on World War II armor. How much do we actually know about German armor and the German Panzer forces? We’ve got the hardware side down pretty well. Tom Jentz did a magnificent job covering the technical history of German tank development. But the operational side, we don’t know as well as people might think we do. In spite of all the stuff that’s been written about the German side, the stuff that’s out there is not very good. A lot of what’s out there on Tiger tanks is very one sided. There are some very good Russian websites that are pointing out all the errors in those Tiger histories, you know German accounts will say “Oh Tiger regiment such and such went this Russian tank unit and destroyed 57 vehicles.” And then the Russians go and look at the unit histories from the Russian side and find that the incident either didn’t occur at all or the German tank claims were grossly exaggerated. So we need much more balanced work done on that, we need better stuff on the German side on the operational side. We are starting to see some stuff come out like Bob Forcyzk’s recent book on tank warfare on the Eastern Front which just came out through Pen and Sword. His first one covers 1941-42. That’s starting to redress the balance. Bob’s a retired US army armor officer and he’s got a PhD in history so he is providing a more balanced picture on the fighting on the Eastern Front and Bob reads Russian and he reads German so we are starting to get a more balanced look. I did a bunch of research for this “Armored Champion” book where I looked at one of the less explored issues, which is German tank reliability. You know, how reliable was the Panther, how reliable was the Tiger. I found quite a bit of material on that down at the national archives and it’s an eye opener. The Panther had awful reliability rates in 1943, starting as Kursk and right through the end of the year. It improves in 1944. It puts a different perspective on the ability of divisions to operate when you see the reliability rates of some of the vehicles. So that will be new in my book and Bob Forcyzk had been bringing out that issue in his books too. Despite everything that is out there on World War II tank combat there is still big gaps and lots of areas for people to explore. Very nice interview. Reliability is crucial. The Lanchester equations extimated combat power as proportional to the square of the number of vehicles you could get to the battlefield. They are probably wrong, but professional officers were familiar with them, and tried to get at least 10 vehicles (100 points) to counter an enemy with 6 vehicles (25 points). One befuddled German intelligence officer, captured in the Bulge, complained, “How many 2nd Armored Divisions do you have?” The 2nd AD had road marched 90 miles in the night from where the German officer knew where it was to arrive in front of what was supposed to be a break through. Mr. Zaloga is exactly right about the scandal with our armored vehicle heritage. I’ve always wanted to see all of those famous and rare vehicles at the Ordinance Museum, but now it looks like I could live another fifty years and never get the chance! Congress can always come up with some new special tax cut or yet more privileges for the 1%, yet they can’t spend even a pittance on not just preserving our historical heritage, but making it available for all of us to see and enjoy! The current situation is a complete disgrace! It does appear that Belton Cooper was taken advantage of, by the publishing sharks. They put his name on that book, along with an inflammatory title, with little regard for scholarship. He likely doesn’t know better, and he did seem a bit naive and slow, when I watched him interviewed. Too bad, and I wish he could get with a proper researcher and clean up some of the confusion, and publish another work, but he passed before that was possible. Belton Cooper’s book was correct. The Sherman was a joke. It was obsolete when it was introduced. US industry was totally capable of building a tank with top armour for driver protection with a good heavy gun. The British were not much better with the Cromwell and they had enough time to get a better tank out than that, although the superior Tiger busting Comet came out only few months after. The Cromwell, although a better tank than the Sherman is saying little as it equally lacked crew protection. The Top Brass were considering crews dispensable playing the numbers game. Gonna disagree with you there. You have zero clue what made a tank good if you think just slapping heavy armor and a larger then needed gun were top requirements, or if you think the Sherman was obsolete when it was released despite being better then basically every enemy tank it would’ve been up against at the time of it’s release. And also you know, despite serving up until the Korean war where it had a better combat record then the T-34/85s deployed there, clearly you know better then they did though. It truly amazes me how, even in this day and age when it’s possible to refute the “invincible Nazi German Army/Equipment!” claim, people still drink that kool aid so heavily. What books other than Deathtraps has given you this ignorant view John? The Sherman was not fit for purpose. It was also not fit for purpose for US forces, being the only tanks they had. It was clearly not the best tank around when introduced, it was obsolete when introduced. A problem in early WW2 western tanks was the engines were not good enough meaning tanks had to be heavy and slow or light and fast. Once the British built the RR Meteor (best tank engine of WW2) they were able to create excellent heavy, fast, designs like the Centurion. The RR Meteor had an excellent power/weight ratio and was powerful. The Cromwell cruiser tank was designed when the RR Meteor was not available, so an inferior fast and lightly armoured tank design came out. It was more an upgraded of the Crusader. The first Cromwells were built just as the RR Meteor was available so were fitted with the engine. The Cromwell went to 50mph the engine was so powerful and had to be detuned. The RR Meteor meant heavier fast tanks could be built. The Comet was an interim up-gunned version of the Cromwell with the Centurion the prime design aim. Hence why the British in 1945 had the best tank. The Centurion was the last of the cruiser tanks – fast tanks. There was still no excuse to build tanks like the Sherman and Cromwell with very poor crew protection. Not enough emphasis in the US and UK was put on tank engine design. Many tanks had commercial engines fitted. The Matilda 2 had two bus engines (if one failed one would work). The Churchill had two bus engines mated to create a flat engine. One Sherman engine was a joining of Cadillac car engines. Slower, heavier tanks with excellent crew protection were preferable to lighter fast tanks. The tank with the best survivability in WW2 was the Churchill. It had armour similar to the Tiger and roomy inside – but slow. The crews liked it. The RR Meteor engine was not available when it was first built, only bus and truck engines. The notion that the Sherman was obsolete “when introduced” does not line up with comments from both British and German soldiers at Al Alamein where the Sherman was first used. As I recall, the official British statement was that it was “The best tank in the world.” At that point, the Sherman was superior to all German tanks with the possible exception of the Panzer IV “Special”, a vehicle which was available only in small numbers in North Africa at that point. The Sherman was clearly obsolete on introduction. The T-34 showed the leading edge of tank design. The British used the Sherman at El Alamein only against poor Italian tanks. You have to be objective. The only good point about the Sherman in winning battles was that 50,000 of them were made, not much else. The British used them in the desert because the Cromwell was not introduced in time. The Cromwell in most respects was a superior tank to the Sherman, but even that was obsolete on introduction in its overall design, although it had some excellent points like the RR Meteor engine and Christie suspension. Some British tankers on first seeing them in England after fighting in the desert were on the brink of refusing to man them. At El Alamein some British tanks were better armoured than German tanks, like the Matilda 2 and the Churchill MK III. The Matilda 2 was under gunned by 1942 with its 2pdr gun, which was fine in 1940. Only 6 Churchill Mk IIIs fitted with 6 pdr guns were at the Battle of El Alamein – one knocked out a Tiger in Tunisia. The Churchill was fitted with either the British 75mm or the 6 pdr. The 75mm was a better all around gun while the 6pdr a better anti-tank gun. The 6 pdr was also made under licence in the USA. So, at El Alamein the British had better armoured and gunned tanks than the Germans but not enough of the up gunned tanks. The slow Churchill, using two mated bus engines creating a flat engine, was planned to be dropped but performed so well it was kept on. There was never an attempt to fit the RR Meteor engine in the Churchill. You do realise John, the the Sherman proved itself superior to the T34 in both Korea and the 1967 Arab Israeli War ? Jeeps_Guns_Tanks, I have never read Deathtraps, only seeing the odd Youtube video of it. The videos only reinforced what was common knowledge about the Sherman. To the British it a tank amongst many in the the British army, and it was only a fill-in tank until real tanks were available, so not a big thing to them. They had to adapt them and put real guns on them. To the US it was everything as it was their only tank. Ad hom’ attacks. Means you lost it. 1) The Sherman was designed and built at the outset of the US Army’s involvement in WW2. This was long before there was any real info available about the Tiger or Panther tanks. 2) The “stopgap” tank you refer to was actually the M3 Lee, which was rushed into production in order to give the US and British armies a 75 mm gun on a tank. 3) The Sherman was built to be able to deal with German tanks of 1942, and its gun was more than capable of that. 4) US tank doctrine of WW2 was that tanks should not fight other tanks if at all possible. If tank units came up against other tank units, it was the job of tank destroyers like the Wolverine and Hellcat to move in and attack instead. 5) The Sherman’s primary role was as an infantry support vehicle, at which it was quite excellent. As a matter of fact one of the chief complaints about upgunned 76mm Shermans was that their HE shells were inferior to the 75mm HE, which limited their anti personnel capacity. 6) while the armor on any Sherman except for the Jumbo was never good enough to really counter guns on tanks like the Tiger, the 76mm on the later Shermans had more than enough punch to get through a Tiger’s frontal armor. 7) Encounters with Tigers were so rare that the US Army never needed to put serious resources into a heavier tank like the Pershing. It was only when the Russians and their large, advanced tank forces became enemy number one that the US saw a need to seriously develop the Pershing’s successors. 8) As mentioned in the article we’re commenting on, in virtually all large scale combat between US and German tanks, the US forces curbstomped the Germans. Facts trump your prejudices, John. Steven Zaloga states that US forces hardly met a Tiger in WW2. Lucky for them. To the British they hardly met German armor. Over 90% of German armor in Normandy was destroyed by the British. Montgomery knew the deficiencies of the US armies and put them in a support role. The British had to meet the brunt of German armour as the British had superior armor. The highest concentration of German armor in WW2 was around Caen, even more than Kursk. If US forces with 75mm Shermans met that head on, they would have been wiped out. The doctrine of only using tank destroyers (self propelled guns) was fatally flawed. The point is not really the Sherman, but the USA not producing a heavy tank relying on one infantry tank. The first tank v tank battle was in 1940. The desert was only tank battles. In 1941 there were many German v Soviet tank battles. Yet the US relies on only one infantry tank in a war that is littered with tank battles. Madnesss. Great interview, am glad that the opinions coincided. “Fury” was well received by the Russian military-historical community. Impressions about the film as mine, and well-known people, including Aleksei Isayev. The Sherman was narrow and tall for transportation on rail wagons and light enough for small bridges. To the Americans who had not seen combat it seemed the right thing to do to get the tanks from the US mid-west to the ports. The British were trying to persuade the Americans to change its design to a lower profile and get them to build road tank transporters. In the desert rail lines were few and far between. In combat tanks were rarely taken in via rail in any theatre. The British were designing and building portable for heavier tanks. The British built the low profile, and exceptionally fast Cromwell. Some Cromwells would jump over canals in Holland they were so fast. The British were unimpressed with American gun designs, to the point they went their own way and took little finished equipment from the USA to the overall needs of its forces. There was a school of thought by the Purvis-Monnet team of 1939/40 (a British and French purchasing Commission) that most equipment could be bought from the USA, with the USA rapidly increasing its industry, with the British and French providing the fighting men producing massive armies. It never got much further than Purvis-Monnet. The British being unimpressed with US gun designs scotched it all. Even the 76mm gun on the Sherman was pretty unimpressive to the British 17-pounder. However, the US did make under licence the British 6-pounder (a pre-war design) anti-tank gun calling it the 57mm. Dear Sir, Maybe you can help me out. I am a WW2 historian myself with one book under my belt (55th FG) and articles in various magazines. 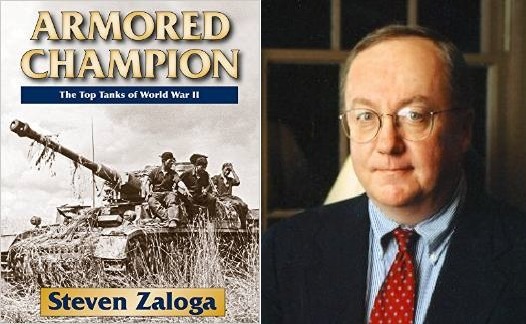 I am a great fan of Mr. Zaloga’s tank books and have his recent one title ARMORED CHAMPION as well as the other three about the history of the Sherman tank. I have been trying to find Mr. Zaloga’s address so I could possibly ask him to autograph four bookplates for the four books of his that I have. Any help will be appreciated. I am a 62 year old retired social studies teacher and I still have my first tank book…..50 FAMOUS TANKS. If you can be of any help in contacting Mr. Zaloga concerning contacting him, I sure would be thankful. it’s funny you should call Tiger extremely unreliable when the reliability rate on Eastern Front became 75% . Is that really “extremely unreliable” according to your standards?